Located only one block from the beach, this 3 bedroom, 2 bath rancher, has a great open concept floor plan.Â It boasts custom maple kitchen with slow close drawers, crown mouldings and under cabinet lighting. We love our beautiful home and so appreciate the quality of workmanship and materials. 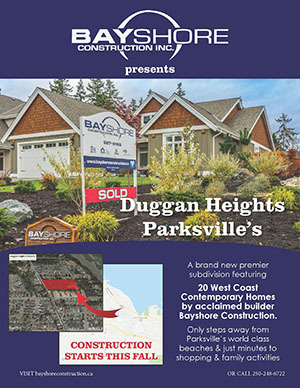 We chose Bayshore Construction. Staff and tradespeople were, and continue to be, helpful and friendly. Our questions were answered honestly and in a timely manner and our house was completed ahead of schedule! My husband and I could not be happier with the quality and commitment Bayshore construction provided for us when building our home.